Q Marshal is our everyday digital display watch that connects seamlessly to your phone. Styled in stainless steel, the tech-savvy dial with touchscreen functionality includes the all-new Android Wear 2.0’s interactive dials (for info at a glance), user-friendly messaging, customizable watch faces and automatic activity tracking. *Powered by Android Wear 2.0, Fossil Q Marshal is compatible with phones running Android 4.3+ or iPhone 5/iOS 9+. Supported features may vary by platform. 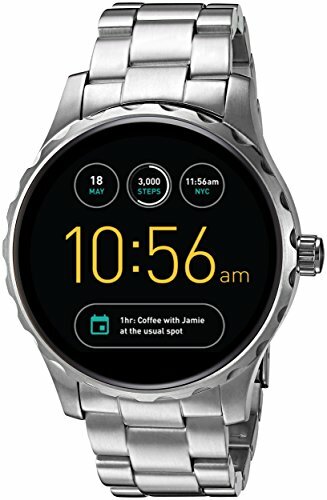 Android and Android Wear are trademarks of Google Inc.
Stay connected with display notifications and touchscreen functionality for texts, calls, emails, and app updates. Our smartwatches use Bluetooth technology to connect to your phone. Effortlessly charge your Fossil Q by placing it on the inductive charging magnet (included). This wearable has an esitmated 24-hour battery life, based on usage.